Essential oils are all natural and distilled from plants. As pet owners, we worry about the wellbeing of our pets and can at times be over cautious. We may worry about using them around our pets, but aromatherapy can be just as beneficial to our animals as it is for ourselves. Cats and birds can be particularly sensitive to some scents. Many essential oils for your pets can have emotional as well as physical benefits. Some oils can be antiviral, antibacterial, antifungal or have antioxidant properties. Every pet may react differently to different essential oils. Do not use oils in puppies or kittens under 10 weeks of age. Cats would need extra caution when using oils such as cinnamon, tea tree, birch, wintergreen and clove. Dogs would need caution when using anise, clove, garlic, and wintergreen. If you use any of these oils for personal use, make sure to wash your hands and keep your pet out of the room if using a diffuser. Make sure to never use near the animal’s eyes, mouth, nose or sensitive areas. Make sure to always dilute the oils you are using. The smaller the animal, the more you will want to dilute the oil, or the less oil you will use. Always observe how your animal reacts to the oil and call your veterinarian with any questions or concerns. While there are oils that can irritate your pet, there are also plenty that can have great benefits. Cedarwood, geranium and marjoram can all help repel pests. Lavender, clary sage and chamomile are great for relieving anxiety. Ginger is great at relieving pain from arthritis. 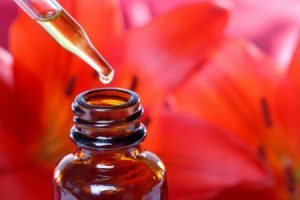 Essential oils can also be used to help with allergies, ear infections, seizures and transitions with bringing home a new animal. Most people use the oils two times a day. It is always important to use essential oils safely. The best way to keep from making a mistake is to use a high quality essential oil diffuser. You will want one that you are able to choose how much oil is dispersed into the air. Less is always better! Diluting with a carrier oil such as grapeseed, olive or coconut oil. Animals have sensitive senses of smell, so in most cases it is best to use oils that are diluted and always provide an escape route. If a pet does not like an oil, please do not force its use.